Peoria, Ill. : Spoon River Press, 1977. Second Edition. A fine copy in the original gilt-blocked cloth. Remains particularly well-preserved overall; tight, bright, clean and especially sharp-cornered. ; 174 pages; Description:  p. ; 22 cm. Subjects: First editions --Identification. 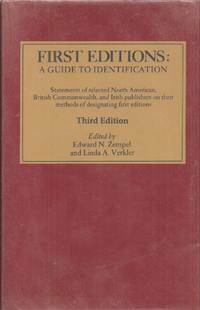 Publishers and publishing..
First Editions: A Guide to Identification. 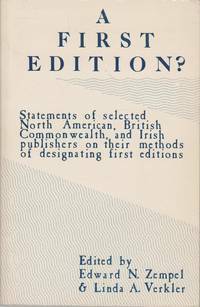 Statements of Selected North American, British Commonwealth, and Irish publishers on their methods of designating first editions. Second edition. Zempel, Edward N. (ed. ); Verkler, Linda A. (ed.). Peoria, IL: Spoon River Press, 1989. 8vo. 307 pp. Purple cloth-covered boards with gilt spine, dust jacket and brodart jacket. Very good with marginal creasing to final pages. Second edition. Peoria, IL: The Spoon River Press, 1995 1st ed. 515pp. red cloth 8vo w/gilt titles: Fine in a Fine dj in poly cover. "Statements of selected North American, British Commonwealth, and Irish publishers on their methods of designating first editions." A classic reference. Peoria, Illinois: Spoon River Press, 1977 This book is in near fine condition and appears unread. 3rd printing, March 1979. The dust jacket is in very good condition and is in new mylar.. Hardcover. Near Fine/Very Good. 8vo - over 7¾" - 9¾" tall. Reference. Zempel, Edward N. & Verkler, Linda A.
Illinois: The Spoon River Press, 1977. 1st Edition . Hardcover. Very Good/No Jacket. 8vo. Blue cloth boards in very good condition. Minimal wear. Binding is tight. Pages clean and free of markings. Peoria, IL: Spoon River Press, 1977. Book. VG-. Soft cover. First Edition. 8vo - over 7¾" - 9¾" tall. 1st ptg. : June 1977. Modest lean, moderate shelf/handling wear. Unpaginated, approx. 150 pp. 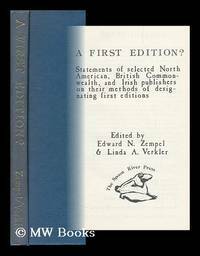 Extremely useful compilation of publishers' own statements, arranged alphabetically, about designations for first editions..
Zempel, Edward N. & Linda A. Verkler. US: Spoon River Press, 1977. 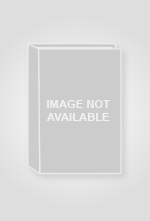 Spoon River Press 1977 Fine/ Bright pages.. Paperback. Fine. Spoon River Press, 1977. First printing. Not paginated, 8vo, quality trade softcover. Nearly Fine copy with no real flaws, just light wear to tips.. The Spoon River Press, 1977. First Printing. Wraps. Very Good condition. Spoon River Press, 1977 Cover has edge wear, minor creases, minor scratches, minor scuffs, small bent/rubbed cover/page corners, rubbed spine. No writing. Very good.. Soft cover. Very Good. Book. Spoon River Press. Used - Good. Former Library book. Shows some signs of wear, and may have some markings on the inside. A First Edition? Statements of Selected North American..
Spoon River Press, 1977-01-01. Paperback. Good. Paperback in good+ condition. Text is clean, bind is tight and sturdy. Some soiling to wraps, light shelfwear as well. Illinois: The Spoon River Press, 1977. Soft cover. Very Good/No Jacket. 8vo - over 7¾ - 9¾" tall. 8vo. Soft cover in very good plus condition, Minimal wear. Pages clean and free of markings.